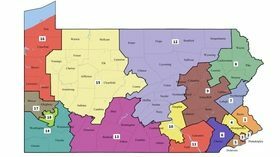 HARRISBURG, PA (WSKG) – Pennsylvania’s Supreme Court has issued a new state congressional map, weeks after it declared the old one unconstitutionally gerrymandered in favor of Republicans. The new district lines significantly improve Democrats’ prospects — and GOP lawyers are already planning to file lawsuits against it.. Under the old map, Democrats won only five of Pennsylvania’s 18 congressional seats three years in a row. In early assessments of the new one, analysts say it gives the party a shot at snagging at least eight, and maybe as many as 11 seats. Democrats have more registered voters in Pennsylvania than Republicans do. But because they tend to be packed into cities, it’s easy to underrepresent them when drawing districts. House GOP Spokesman Steve Miskin says he feels the court’s now going out of its way to make Democrats competitive. Republicans haven’t yet confirmed what court they’ll sue in or when, though a filing will probably happen this week. Senate Republican lawyer Drew Crompton says a separation of powers case will form the essence of the GOP’s argument. He won’t say whether Republicans will go to a district court or the U.S. Supreme Court or what type of legal remedy they’ll seek. But the case will involve making the argument the U.S. Constitution gives state legislatures and governors, not courts, the power to draw congressional boundaries. Earlier this month, the U.S. Supreme Court wouldn’t stop the state court’s order to redraw congressional districts. Democratic Gov. Tom Wolf calls the new map an effort to remedy the state’s unfair and unequal congressional elections.